"We were overwhelmed by George Lucas’ Star Wars, by the quality of the design, the scope of the story, the fidelity to the technology, and the money which was being spent on the production. Coincidentally, Charles Lippincott, an executive of the Star Wars Corporation, viewed Mediascene in much the same kind of terms. Up to this point, only a very limited amount of data on the film has been released for publication to any periodical. Therefore, we are more than pleased to report that Mr. Lippincott has considered Mediascene significant enough to make an exception by granting us an exclusive on the making of Star Wars." 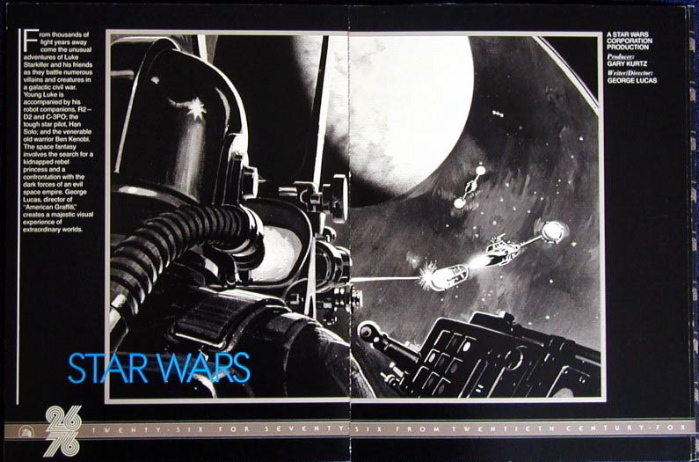 With Ralph McQuarrie’s updated rendition of a TIE Fighter Pilot’s cockpit view on the cover (an earlier version of which was also featured in 20th Century-Fox’s “26 for 76” Campaign Book), the issue centered around a three-part Star Wars preview. The November-December 1976 issue of Mediascene was the first magazine to feature Star Wars on the cover, though it apparently went to print late and was not distributed to subscribers until early 1977. The central piece was an article by Carl Macek which covered the film’s characters, story, special effects, and bios of the cast and crew. Most visually captivating were representations of some of the film’s "rockets, fighters and other technology oriented equipment" that "reveal the lengths to which Lucas has gone in his reach for superior film entertainment.” Macek notes that “Star Wars is so ‘far out’ that neither Earth, Earthmen, or even our entire solar system is ever mentioned during the course of the drama. One gets the eerie feeling after digesting the story that the heroes, villains and characters of the film have never heard of Earth or its inhabitants." Funnily enough, this was a somewhat surreal detail that struck me about Star Wars movies from a young age. I loved that Earth and its realities had nothing to do with them. Two-page spreads of special artwork were a staple of Mediascene, such as this one for Nov-Dec 1976. Revealing plot points for a Star Wars film is a most taboo subject in today’s media, but Mediascene essentially lays it all out. At that point, it was unclear who would really care. Our heroes’ "unique skills...confound the star troopers to such a degree that their ultimate escape is accomplished with relative ease (except for an important casualty during the confrontation with Lord Darth Vader of the Death Star)." Stating that a key character meets their death so matter-of-factly is kind of ludicrous. Less so is affirming that the good guys do indeed prevail at the end, and Macek puts it eloquently: "The ultimate success of the rebels is costly, yet the sweetness of freedom and the dedication to their cause more than makes up for the sacrificed lives. The combat has been won – the war is another matter, possibly to be solved in some future sequel." Macek goes on to provide coverage of the film’s production and the artists behind its look, namely Ralph McQuarrie and Los Angeles-based artist Ron Cobb, who was "commissioned to visualize a series of aliens which populate Star Wars. His creatures range from an ambulatory plant which sips cocktails to a huge, surly rhinoceros-like beast who appropriately sits bored and alone." How sad. Closing the article is a preliminary survey of the film’s forthcoming multimedia pre-release buzz, from the comic book adaptation and novelized screenplay to a sequel book, "making of" book, and a volume of illustrations that were all slated for the months ahead. Macek comments that this "manipulation of Star Wars through a variety of medias merely suggests the tremendous interest the producers feel the film will generate." If he only knew. Well, perhaps he did? "Though there are those who will probably refer to Star Wars as nothing more than ‘popcorn,’ the film easily transcends such a description….who’s to say that sometime in the far future, Star Wars won’t be considered in the same terms as The Three Musketeers, Les Miserables, Tale of Two Cities and King Arthur and the Knights of the Round Table." The issue’s second Star Wars feature offers a preview of the film’s opening sequence through a comic strip style assembly of storyboard illustrations by production designer Alex Tavoularis. Lastly, Marvel’s serialization of the film is highlighted with commentary from prolific comic writer Roy Thomas. Adapting a movie that had yet to hit theaters presented certain challenges. Particularly, it was important for Thomas not to contradict things big and small that may be occurring on screen. For instance, "finding out if there are going to be sound effects in outer space." The feature goes on to say that "...with the initial episodes being released prior to the film’s opening…It is hoped in that way that the public will be made aware of Lucas’ project well in advance, allowing for a build-up of interest and an elimination of an uncertainty about the nature of the film." As for the potential continuation of the comic series: "the possibility exists for adapting the sequel to Star Wars which has already been written as a novel by Alan Dean Foster." Knowing now that Marvel’s Star Wars series would be a major factor in the company averting financial disaster, the article’s final statement rings ever true: "The entire project will be weighed against the ultimate success of the movie…Whatever happens...the first six issues will prove to be an interesting and highly imaginative barometer of the shape of things to come." Shortly after the film blasted its way into theaters across the United States, Mediacene’s July-August 1977 issue continued the magazine’s reporting on the "runaway avalanche" that was Star Wars, claiming that though "it would seem that everything that can be said about the film has been said. Don’t you believe it." With a previously unpublished character ensemble painting by Ralph McQuarrie gracing the cover, the issue delved deeper into the "ontogeny Star Wars went through" over the previous five years leading up to its release. It also details the trials and tribulations of the film’s marketing and publicity campaigns, including the development of various poster designs. More specifically, the article mentions Charlie White’s swashbuckling commissioned poster (which would eventually become the key art for the 1978 Style D re-release) as a forthcoming limited edition print to be released later in 1977. The marquee two-page spread from the Jul-Aug 1977 issue was a rather psychedelic rendering of Tom Jung's art. In terms of sequel talk and unsubstantiated rumors, Macek states that Alan Dean Foster’s follow-up novel (the soon-to-be Splinter of the Mind’s Eye) was ”still being written, but it is not necessarily going to be used as source material or as a script for Star Wars II (or whatever the title may be),” and that despite reiterations to the contrary from Lippincott, fans were "still proclaiming ‘facts’” like “Darth Vader will be killed off in Star Wars II” or that the sequel had already been filmed. Regardless of reckless speculation, Macek argues that source material from artists like McQuarrie & co. that "attempted to visualize the unknown...will be the backbone of Star Wars’ marketing future.” With the heavy presence of McQuarrie designs that continued through the Prequel Trilogy and remains steady in the Disney era, Macek could not have been more right. 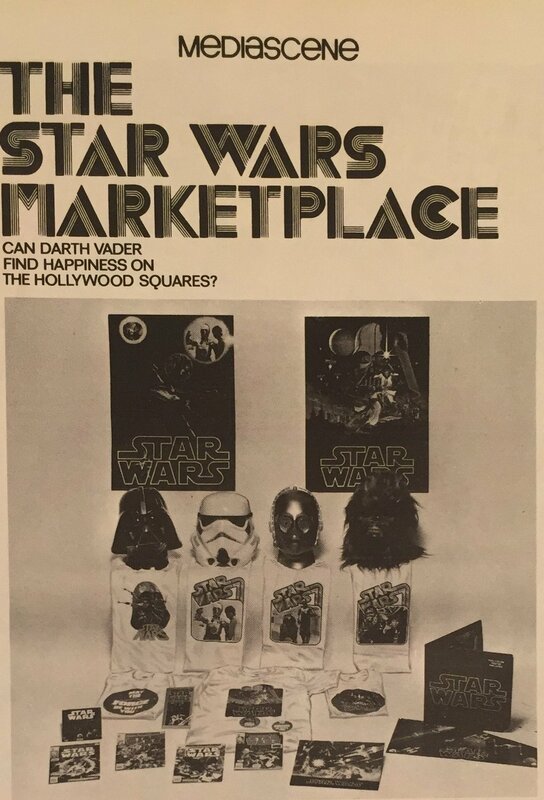 The July-August 1977 Issue’s 2nd Feature: "The Art of Star Wars: A Previously Unpublished Portfolio"
This ad showcases some of the quality licensed products available for fans, including the commercial Hildebrandt poster for $2.00, the 1978 Star Wars Calendar for $4.95, the Star Wars Portfolio for $7.95, the Star Wars Sketchbook for $4.95, and Star Wars Blueprints for $6.95. As it turns out, "apparent insanity” and Star Wars fans have had long-standing connection. Well, perhaps a unique combination of insanity and devotion. On the production side, it’s specified that science fiction writer Leigh Brackett’s October, 1977 reading of Alan Dean Foster’s manuscript for Splinter of the Mind’s Eye formed the basis of her initial screenplay draft for the new film and that Ray Harryhausen had "reportedly been contacted to provide the various beasts and creatures needed for the jungle-planet sequences, and the outlook for his participation is within the realm of probability because his four-picture deal with Columbia [was] not restricted by time limitations.” Though Tauntauns and AT-ATs definitely embody the stop-motion legend’s work, the Lucas-Harryhausen collaboration was never meant to be, as he would go on to work on Columbia's Clash of the Titans beginning in May, 1979. This Empire-focused July-August 1980 publication contains correspondence in the "Letters from Readers” section that feels strikingly relevant given the franchise’s more recent history. Since reading in MEDIASCENE 38 that your West Coast Editor, Don Glut, is writing the novelization of The Empire Strikes Back, we feel you are in a good position to dispel many of the harmful rumors that have been circulating in Star Wars fandom lately. The mere thought that Luke Skywalker gets maimed in the climactic lightsabre duel (it has been said that he gets his hand cut off) makes many fans cringe. Further rumors have been that Luke is Darth Vader’s son, that Han is put into a stasis field, unable to be rescued, that Han is killed, and others. We know these to be completely untrue – Star Wars is intended primarily for children – but many fans from whom we receive letters because of our Star Wars fanzine actually believe these things, and are becoming very angry at George Lucas. Most of these ‘truths’ are being spouted by Dave Prowse at SF conventions. Force knows why he is so vindictive. If you could debunk these rumors in your magazine, it would be greatly appreciated. You would be revealing none of the plot of the film – only informing a very ignorant fandom of what will not be. Along the same lines, we are anxious about the report in your magazine that Ballantine Books plans to release the novelization of The Empire Strikes Back in mid-April, an entire month prior to the film’s release date. What happened to the idea of keeping the plot a secret? Certainly book sales won’t be hurt by a month’s hold in distribution. Yes, believe it or not, we as fans are asking you and Lucasfilms [sic] not to tell us any more about the plot of Luke’s long-awaited next adventure. We have waited 2 ½ years already – we can wait a bit longer. Below is Prevue's official response, which is reasonable if not slightly underhanded (pun intended) with regard to Luke's rumored lost appendage. Tracy and her sister Nancy’s "Against the Sith" was among the first Star Wars fanzines, and the pair would go on to write and distribute a nine-page "Open Letter to Star Wars Fans” decrying the characterizations and plot of The Empire Strikes Back. They purportedly called for a fan boycott and demanded that George Lucas destroy all copies of the film. Though the Duncans eventually came around on the film in public comments, their initial outrage has a familiar flavor. Empire’s director would only watch Star Wars one more time (on a Moviola, no less) before beginning work on the sequel, which speaks to how distinct the two films turned out to be. Mediascene Prevue's Empire Strikes Back Feature "The Empire File" also contained character bios and an interview with Ralph McQuarrie. 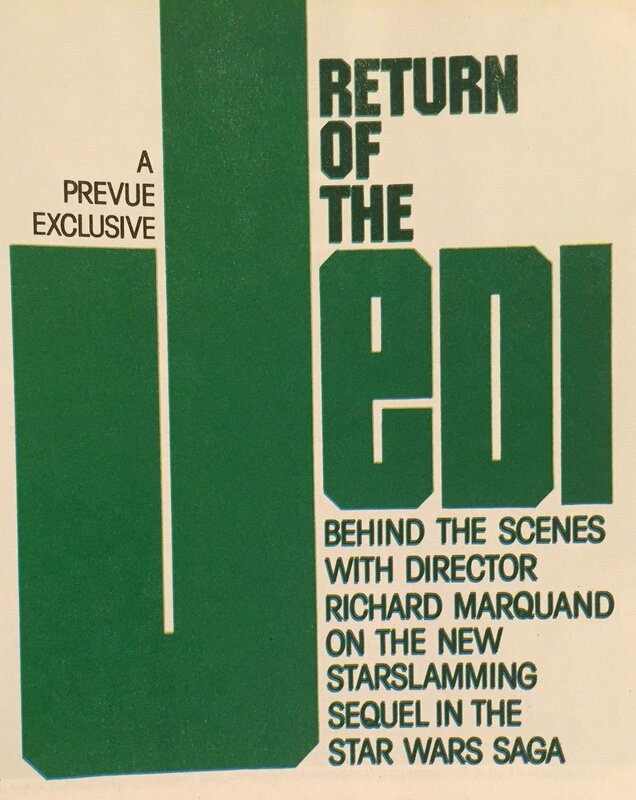 When Return of the Jedi was released, Prevue had shifted completely toward a traditional magazine format and the June-July 1983 issue’s coverage of the film is solely comprised of an interview Jim Steranko conducted with director Richard Marquand during post-production work in Los Angeles. Marquand comes across as both joyous and down-to-business, with enough enthusiasm to make up for a lack of depth present in Mediascene’s previous Star Wars commentary. With a sequel trilogy still on his mind, Steranko surmises that "Spielberg will eventually direct one. And John Milius told me he’d like to do the last one, the ninth and final Star Wars film.” In 1983, both circumstances must have seemed quite plausible and are intriguing what-ifs to think about. In any case, directing a Star Wars film certainly requires a level head. And for as big a movie as Return of the Jedi was, Steranko’s assessment of Richard Marquand as being "Disgustingly well adjusted” is a Star Wars director prerequisite that remains suitable to this day.